Curated by Carly: Reunited And It Feels So Good! Over a month ago, I realized I had lost my favorite monogram necklace - the one I wore in every OOTD and felt naked when I forgot to wear it. Sadly, I lost my necklace during my trip to New York City and have felt lost ever since. It's like a part of me had been missing! Luckily, the mailman brought me a shiny new friend in my darkest hour: a new monogram necklace from Crystal Faye's shop! This necklace is absolutely stunning and I couldn't be more happy! 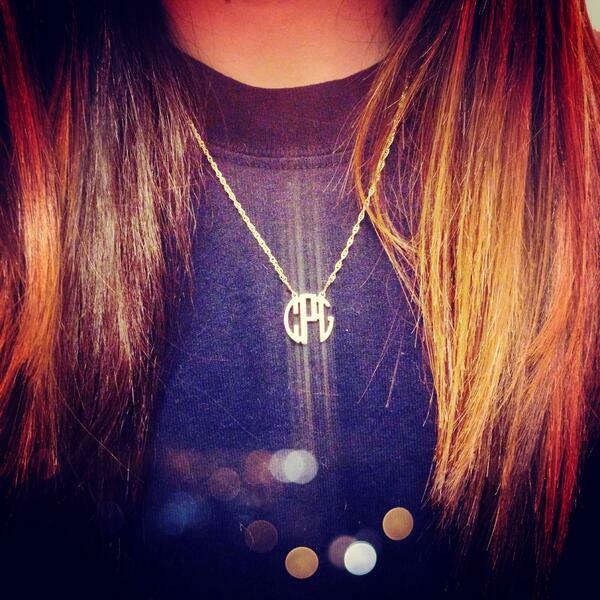 If you're looking for some more monogrammed goodies, be sure to order your jewelry and more from Crystal Faye! Have a fabulous Wednesday, everyone! Yay! So glad you got another one! I was in Barcelona a few weeks ago and bought a cute ring and then lost it an hour later. Luckily I put my gloves on a few days later and my ring was in the glove! I'm definitely going to have to check out Crystal Fay for a monogrammed necklace before I leave for Europe! I'm obsessed! I really need to get one! They are such a great statement!